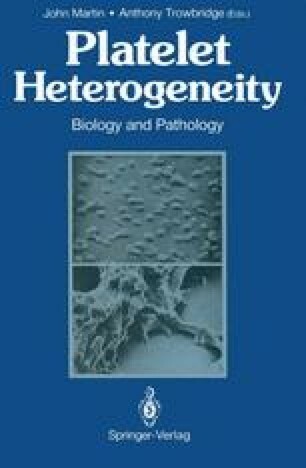 The question is not just “Is platelet heterogeneity due to ageing or thrombopoiesis?” The question also implies an attempt to understand what happens to platelets as they circulate under normal and abnormal conditions, and why and how they are eventually removed from the circulation. What changes occur in platelets when they interact with an injury site on a vessel wall, or encounter an aggregating agent in the circulation? The petechial haemorrhages that are characteristic of thrombocytopenia indicate that platelets are necessary to maintain the integrity of the endothelium. How do they support the endothelium and are they altered in doing so? No attempt will be made in this review to answer all these questions, but they are posed to illustrate that it is not unreasonable to suggest that platelets may be changed because of their encounters in the circulation.